In a big victory for walking, biking and running, the city broke ground on the much-anticipated Lincoln Village Bridge on Chicago’s Northwest Side. The bridge will connect existing multi-use trails on the east and west sides of the North Shore Channel Trail just north of Lincoln Avenue and south of Devon Avenue. It’s another exciting step towards a continuous Chicago River Trail. A 27-mile trail would transform areas around the river into vibrant open spaces and connect people to jobs, shopping districts and recreation opportunities. The Lincoln Village Bridge will eliminate the need for people walking and biking to exit the trail and use the heavily-trafficked Lincoln Avenue Bridge to cross between the east and west sides of the North Shore Channel. 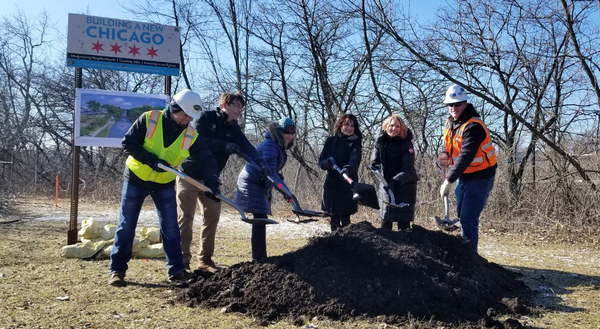 Active Trans was thrilled to join Chicago Department of Transportation Commissioner Rebekah Scheinfeld, CDOT Project Manager Lubka Benak and 50th Ward Alderman Debra Silverstein at the recent ground-breaking ceremony (pictured). The pedestrian and bicycle bridge will fill a key gap in the North Channel Trail, providing a continuous path for 6.7 miles from Lawrence Avenue in Albany Park through Lincolnwood and Skokie to Golf Road in Evanston. Expected to be completed this fall, the bridge will connect to a new Bernard Stone Park and trails on the river’s west bank. We’re excited to see the city take another major step towards a continuous Chicago River Trail. This project is a reminder that completing a continuous river trail will take persistent advocacy. In addition to the Lincoln Village Bridge, construction is well underway on the 312 RiverRun and Manor Greenway — both of which will make it easier to walk, run, and bike along the Chicago River. We’ll continue to monitor river trail projects and provide opportunities to get involved. Have you joined the Chicago River Trail campaign? Sign up here.